Reginald D Hunter brings his highly anticipated brand new show to The Cresset on May 21. ‘Some People v. Reginald D Hunter’ is a dazzling show, tackling subjects as varied as families, boyfriends and girlfriends, Donald Trump and why the O.J Simpson case was “The pivotal moment in race relations in America.” Often provocative but always mesmerising, Reginald spellbinds audiences with his compelling brand of comedy and his piercingly honest material has gained him an enormous fanbase that spans the generations. Born in Albany, Georgia, the 47 year old is one of the most thought-provoking and thrilling stand-ups around. Reginald initially came to the UK at the age of 27, to study drama at RADA. He switched to full-time comedy after accepting a dare to do stand-up. Reginald is a regular on our TV screens, featuring in various shows including Have I Got News For You, QI, 8 Out Of 10 Cats Does Countdown and his own three-part BBC2 series Songs Of The South, which follows the comedian on a hilarious road trip through America and through 150 years of American song. In 2006 Reginald won the Writers’ Guild Award for Comedy .Although his humour is sometimes seen as controversial, the stand-up believes that comedy can help to change people’s minds. 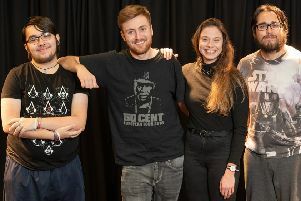 From an interview with James Rampton, Reginald hopes that his tour leaves people feeling a “little bit brighter about the gloomy news headlines, and that people come away feeling less distressed about our current situation.” The Daily Telegraph describe Hunter as ‘Stand-up comedy’s coolest customer.’ This is the ideal comedy show for all ages. Support for the show comes from Glenn Wool. Tickets are £24.50 and available online or on 01733 265705. The show starts at 8.00pm and is 18+.